Long before Samuel L. Jackson asked about the contents of your pocket, I started to document what I kept in my pockets each day. Since then, many people have taken up the practice, including myth buster Adam Savage. And, if you’re a curious person, learning what other people carry can be interesting. Today I’m looking back on what I used to carry in 2007, in 2010, and now in 2016. I’m glad to say that I’ve trimmed things down a bit, but not completely. First, let’s look at what I had on me in 2007. Back then, I carried a Moleskine notebook, an original iPhone with headphones, a Pilot G2 pen, a wallet, keys, and a 512MB flash drive. The flash drive is especially hilarious today, not only because it had a capacity of 512MB, but because I schlepped it around in the first place. Today, with nearly ubiquitous internet and cloud services like Dropbox, I simply don’t need the flash drive anymore. 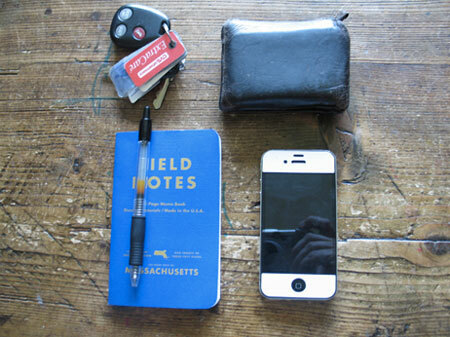 Field Notes Brand notebook, and the original iPhone became an iPhone 4. I ditched the earbuds because I only listen to the audio while in the car. The wallet and keys are exactly the same (minus Chewbacca), though the wallet contains fewer “Bonus Club” type cards than it used to. Drafts, which accepts dictated notes via my Apple Watch. When you get over the embarrassment of talking to your arm in public, you realize how amazingly fast it is to say, “Remind me to buy milk” to the Apple Watch, knowing that your words will be transcribed to a note-taking app on the iPhone. I love it. A newer model iPhone has replaced what I was using in 2010 and my wallet has become a bit smaller. I’m very pleased that I’ve gotten rid of the store loyalty cards, as they’re a hassle. Finally, Yoda has replaced Chewbacca. Noticed that, you did. There other rules. I have a billfold wallet that folds in half. It always goes into my pocket with the “hinge” if you will facing up toward the sky. That’s because if I put it in with the hinge facing down, I’ll inevitably put the keys “inside” the wallet, so that I can’t pull it from my pocket without taking the keys with it. 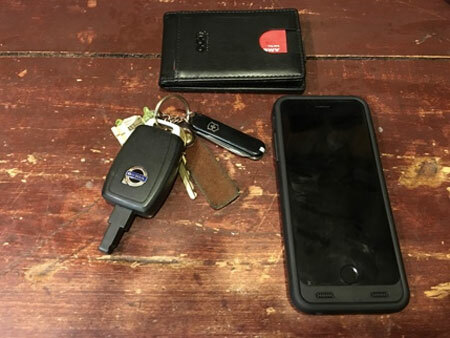 Moving the keys is important here, as a bulky coat typically makes it harder to get into jeans pockets, so the wallet and keys — the items I access most often — are made more accessible. Why go through all this nonsense? Because when you know where things are, you save huge amounts of time. For me, it extends beyond my pockets. For example, when I park the car at the grocery store, I always park in the side lot to the far left of the store. When at the drug store, I park at the end near the dumpster. I never have to wander the lot wondering where my car is because I make parking in the same spot a habit. What do you carry and where do you carry it? If you haven’t ever thought about your choices, maybe spend a few days taking notice of what you need and when you need it, and then streamline the process. Doing so will certainly help you save time and effort in the future. Left pocket: Swiss Army Mini Champ and fidget stone. Right pocket: Earplugs and nail clipper. My wallet was 1 1/2 inches thick with all the affinity cards.Now,I keep them in a sandwich bag stored in my car door. Remove the cards I need to shop,replace back in the bag when done. Takes a little getting used to (remember the card as you open car door) but works well. There’s not one thing in any of my pockets. It’s all in my handbag. The biggest life save for me has been a purse organizer that I can lift out and put in another bag. It holds keys, credit cards, check book, pen and highlighter, a mini flashlight, and a lipstick. My wallet goes in by itself because it’s a little too long for the organizer and I keep my phone in an outer pocket of my bag. About once a week I clean out receipts and such and like Dave i have been working on reducing what I carry. But I have a ways to go. Phone, inhaler, hanky, keys while on the job. Everything else stays in the purse at home. Note to all readers: women need pockets in clothing. Build them in. Yes, women need pockets too. In my bag, I keep everything in the same spot no matter which bag I’m using that way, I can reach in with one hand to the designated part of the bag and know that I’ll pull out my wallet, glasses, mints, phone, etc. It’s the same at home, bag/keys/leash/current jacket are all placed in the same spots every time. I don’t have to think where anything is, I can grab and go. Leslie: same for me. Also I have a small tote in the back seat of the car with local street maps, nail files, trimmers, toothpics, loyalty cards, nasal spray, etc. This way the small over the body purse is minimal with wallet key fob, pen, and house keys. Checkbooks stay home for bill paying. A large gal. size Ziploc bag will work too for the car. No need to carry all that around for running errands. I’m retired and unclutter regularly. I have a place for items when I come home, always same place. David C. I will take your advice on parking same places when going to stores, less confusing over all. I don’t carry a purse. I found it interesting that I use my left pocket for the phone and it seems that everyone else uses their right pocket.